comic books, where characters such as Batman, Spider-Man, Captain America and hordes of their lesser-known colleagues are found. Tho he's practically unheard-of today, The Clock has the distinction of having been the very first in that medium. Comic books in their modern format (they began with Famous Funnies, #1, which was dated July, 1934) had been around only a couple of years, reprinting newspaper comics, before they started running out of newspaper comics to reprint. The Comics Magazine (published by a company of the same name — it's remembered as "Centaur Publications", which it switched to a few months later) began publishing brand-new material in comic book form with a cover date of May, 1936. With the sixth issue (November, 1936), the title was changed to Funny Pages. That issue was also the one which introduced The Clock, by cartoonist George Brenner (who later created the equally well remembered Bozo the Robot and both 711 and the character who replaced him, Destiny. That same month, The Clock appeared in the same publisher's Funny Picture Stories, but bibliographies tend to list Funny Pages as his debut (even tho he was the main cover feature of Funny Picture Stories). Funny Pages allotted only two pages each to its characters (which included such memorable ones as Little Beezer, Hezzy of the Hills and Dickie Duck), so there wasn't room for many frills — such as a personal life. 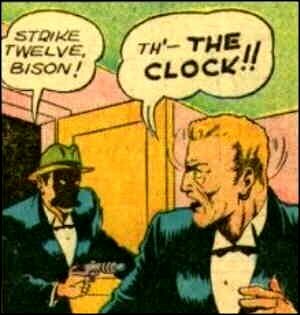 The Clock fought crime, wearing a business suit and a full-face mask, and that was it. He usually left a calling card, which depicted a clock accompanied by the words "The Clock Has Struck". Later, when he was appearing in larger chunks, there was space to show he was former district attorney (and current society fop) Brian O'Brien, whose qualifications as an action hero included a background in college football and polo. There was even room for an occasional supporting character, such as Pug Brady, Brian's exact double, who served as his sidekick for the first couple of years. Toward the end, he took on a teenage girl named Butch in that role. The Clock appeared in several Comics Magazine/Centaur titles, including Detective Picture Stories and Keen Detective Funnies. But Centaur Publications didn't go on to become a major publisher, and all those titles were soon gone. Many of its properties passed on to Quality Comics (Plastic Man, Blackhawk), which did become one of the majors. The Clock's first appearance at Quality was in the third issue (December, 1937) of Feature Funnies, which at the time mostly reprinted newspaper comics (such as The Bungle Family, Dixie Dugan and Mickey Finn), but peppered them with a little new material. Brenner continued to write and draw his adventures. He continued through a name change to Feature Comics, until the 31st issue (April, 1940), shortly after Doll Man had become the main feature, which signalled the phasing-out of reprints. It was during the Feature Comics run that Will Eisner, who packaged material for Quality, probably got partial inspiration for The Spirit from him. The character wasn't dropped, merely transferred to help launch a new title, Crack Comics, which started with a cover date of May, 1940. For the first year and a half, The Clock alternated cover appearances with The Black Condor, a more standard superhero, but made his last appearance there in the 19th issue. He continued in the back pages (trading in his full-face mask for a more conventional domino style) until #35 (Autumn, 1944), after which Brenner (who had become editor of Crack Comics a few months earlier) no longer wrote and drew for the title. By that time, masked heroes were no longer in vogue in comic books, and The Clock's series ended. In 1956, DC Comics acquired Quality's properties, but it's never made use of this particular one. In 1992, Malibu Comics, a minor publisher later absorbed by Marvel, launched The Protectors, a superhero group made up of a few updated versions Centaur characters (e.g., The Masked Marvel, The Arrow, Amazing-Man) and a few new ones, and The Clock (now retired as a masked hero, having become, like Nighthawk of The Squadron Supreme, U.S. president) was part of the mix. It lasted two issues. Comic books' first masked hero hasn't been seen since. Text ©2005-10 Donald D. Markstein. Art © Centaur Publications.